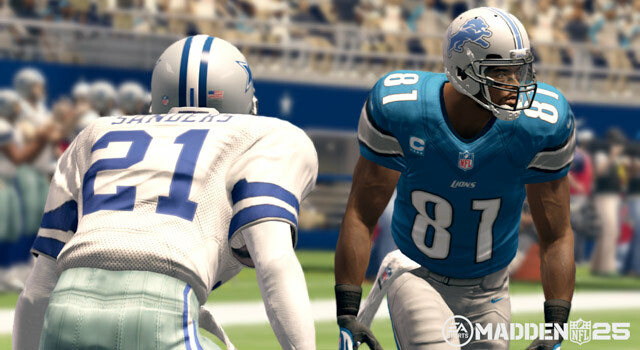 Madden predictions: Primetime or Megatron? Published: Nov. 1, 2013 at 08:55 p.m. Updated: Nov. 2, 2013 at 12:54 a.m.
Cowboys GM Jerry Jones said this week Deion Sanders could cover Calvin Johnson. Of course he did. Deion Sanders, of course, took the high road. Well, good for him. Deion said it wasn't fair to compare eras. Uh Deion, this is what we do as sports fans. We argue about stuff that can never have a true answer. I mean, I've spent the better part of the week lecturing kids around here about how Magic Johnson is the best player in NBA history. Oh wait, that one has been proven, and it's Magic Johnson by a landslide. But back to the football. Deion also noted that he played against a lot of Hall of Fame quarterbacks, too. He's got a point, because today's era of cornerbacks play against no Hall of Fame quarterbacks and the rules haven't been completely slanted to favor the offense. He wrote, facetiously. Besides that, we have Madden 25 to help put these arguments to rest. So now I have my homework assignment for the weekend and I'll be sure to matchup Deion against Calvin to get the most scientific answer possible. Or something like that. Let's get to the ratings ups and downs. Kenny Stills was one of Rank's 11 in fantasy football (yes, I do moonlight as a fantasy expert) last week when he torched the Buffalo Bills for a pair of touchdowns in Week 8. So it's no surprise he received a boost up to 73, with the huge swing being a six-point increase in awareness. Just be careful about his matchup this week against the Jets. New York has allowed 15 touchdown passes this season, but just three of them have been at home. Speaking of guys burning the Jets, Marvin Jones received a boost as well as he scored four touchdowns against the Jets. His OVR increased five points to a 79 this week. And he would have been up for another increase the following week if Jermaine Gresham hadn't ruined a potential touchdown for him against the Dolphins on Thursday night. I'm not sure how a lot of you play defense, but I love to use the disruptive force on the defensive line. And one of my favorite guys is Calais Campbell. He's a monster at 6-foot-8 and he's been nearly unstoppable this year. Campbell is up two points this week to a 95 OVR. A pair of running backs made a nice two-point swing. Zac Stacy has gained at least 75 scrimmage yards in four consecutive games and he's up to a 76 OVR thanks to a five-point gain in AWR to 64. Andre Ellington had a huge week for the Cardinals and he's now a 75 with a two-point bump in ELUS to 91. Jarrett Boykin is up two points to a 74, but he still figures to be a prominent part of the Packers passing attack even if James Jones does return this week against the Chicago Bears. Matt Barkley was dinged for two points as his OVR dropped to 71. You might need to hold on to your controllers for this, but Barkley really took a beating in the accuracy department. Oh wait, that's not surprising at all. You know, with all of the injuries to the Atlanta Falcons, I feel like Matt Ryan has played admirably. But Madden shows no love for Ryan this week as he's down two points to a 92. Here's his full line: AWR: 90 (-2); THA: 91 (-1); TAS: 91 (-1); ThrowAccuracyMid: 88 (-2); TAD: 84 (-2); TOR: 77 (-1). Harsh. Robert Griffin III (88 OVR) and Christian Ponder (80 OVR) both suffered one-point losses this week. Does this seem weird to anybody else? Oh well, if I could, I would somehow find a way to increase Ponder's rating because of this. I'll admit I wasn't the hugest believer in Terrelle Pryor when the season started for the Raiders. But he's really come on as of late. And his run against the Steelers to open the game was completely slick. This wasn't even a Madden-type play. You'd have to go to some of your older consoles to recall a play so unbelievable. But he gets just one point this week to a 79 OVR? Great Caesar's Ghost. His SPD (+1 to 91) and ACC (+1 to 93) were increased, but come on folks, this should be updated immediately. Well, it's not like you're going to have a choice since Pryor is going up against the Philadelphia Eagles this week. The Eagles can't stop anybody. Poor Chip Kelly, he's going to be watching the quarterback he wished he had running his offense. Do you think the Raiders would take Matt Barkley? 6. Eddie Lacy will lead all players in rushing yards in Week 9. Lacy had a one-point boost to an 80 this week. This simply will not work. 5. Kenjon Barner will score a touchdown for the Carolina Panthers this week and even Madden programmers will be all, "Who is this guy?" 4. The Cleveland Browns will knock off the defending Super Bowl champions. Beating the Ravens is still fun for the Browns and it always should be. 3. The Seattle Seahawks will put a 70-spot on the Tampa Bay Buccaneers. Greg Schiano will be fired before he gets on the plane and he will stick around the Seattle area to coach the Washington Huskies after Steve Sarkisian moves back to Los Angeles to take over for USC at the end of the season. 2. Philip Rivers will throw for 356 yards and three touchdowns against the Washington Redskins. Then he will taunt RGIII because ... Philip Rivers. 1. Tom Brady didn't move down this week! And he's going to have a monster game against the Steelers. He owns the Steelers. Brady has 10 total touchdowns and no interceptions in his last three games against Pittsburgh. If any quarterback has clearly had his way with the Steelers in this decade, it's Brady. And if he doesn't do it, blame Daniel Jeremiah. He's the one who got me all excited for Brady this week. 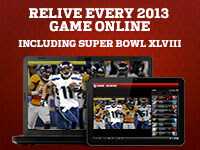 Don't forget to vote for the "Madden NFL 25" Next Gen champ! 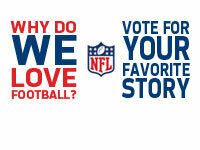 Voting for this week will open after the Monday night game between the Chicago Bears and Green Bay Packers.